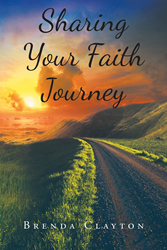 “Sharing Your Faith Journey” from Christian Faith Publishing author Brenda Clayton is a helpful guide for members of a small group or bible study when they journal their thoughts and experiences as a personal testimony, because one’s faith should be boldly proclaimed in present times. “Sharing Your Faith Journey”: a riveting work that aids in recalling one’s life journey with the Lord and the development of his or her personal faith. “Sharing Your Faith Journey” is the creation of published author, Brenda Clayton, a wife, mom, and grandmother who has had careers in banking, real estate sales, and appraisal. She was also a natural childbirth teacher who developed a home decor and a gift basket business. Published by Christian Faith Publishing, Brenda Clayton’s new book is an interesting work that serves as a tool for writing one’s faith journey—like the major seasons, ideas, and lessons that have the most impact in his or her life—so that the process of distilling words into a cohesive storyline will be effective. Clayton has included excerpts of her personal testimony as examples on writing and editing her story of faith. She stresses that a well-thought-out storyline is important in writing about the Christian walk—the main point should be clear. View a synopsis of “Sharing Your Faith Journey” on YouTube. Consumers can purchase “Sharing Your Faith Journey” at traditional brick & mortar bookstores, or online at Amazon.com, Apple iTunes store, or Barnes and Noble. For additional information or inquiries about “Sharing Your Faith Journey”, contact the Christian Faith Publishing media department at 866-554-0919.